If you would like to pursue a doctorate in one of the geosciences at the University of Cologne, the first step is to find an official principal supervisor. This has to be a person who is legally entitled to supervise a doctoral research project in the Faculty of Mathematics and Natural Sciences (MNF) (a professor or Privatdozent). 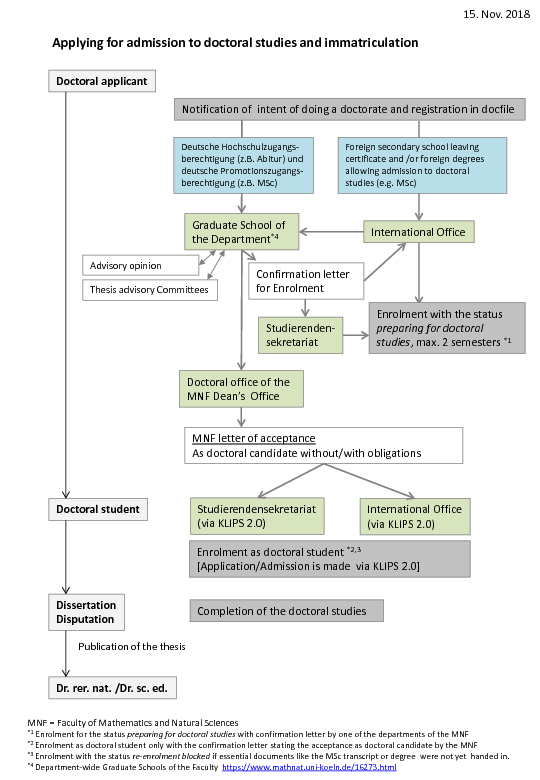 Subsequently, you will need to hand in your Notification of Intent to do a Doctorate (“Mitteilung der Promotionsabsicht”) at the Dean's Office of the Faculty, which is only available in German. For this, you will need both the signature of your professor and of the GSGS manager. For details of the whole PhD procedure and for downloading the latest version of the form visit the Internet pages of the Dean's Office. Please visit the website of the Albertus Magnus Center (AMC - the university-wide center for supporting early-career researchers) for general information on pursuing a doctorate at the University of Cologne, e.g. on how to go about finding a supervisor.